Atys, STC-Shaped Guitar from Hufschmid Guitars. This Hufschmid Atys, which you can see below, is my sixth Hufschmid. Before this one, we worked on a seven string superstrat in 2010, a six string mockingbird-like in 2011, another six string superstrat in 2012, a second seven string superstrat in 2014, and a six string superstrat Helldunkel in 2018. It seems a lot, but everything is never enough… Patrick has been offering his own version of a headless guitar since 2012, but I never really got interested into it, as headless guitars always referred to ergonomic weird instruments which I personally dislike, such as Strandberg or other works like this. However, the Hufschmid approach is very different as it stays as close as possible to a standard superstrat design, only with a large cutaway after the bridge which, combined with the missing head, lightens the instrument a lot. The construction is once again exemplary, when people see this guitar, they usually think it’s made using a CNC, and are surprised to learn that it’s not.. The lack of wood near the bridge, which can seem unusual, first made me curious about how the balance would be, but there were no doubts to have : the massive bridge adds some weight and the missing headstock compensates efficiently on the other side, making the whole guitar actually very balanced ! From an ergonomic consideration, all those cuts give the instrument a feeling of being “short“, very easy to use and practical. It brings a very organic feel when you hold it against your body, making it the most comfortable guitar I own, considering its light weight as well. The neck is made even more stable and stronger as it is shorter than usual, and very easy to play on without being too flat or too thin, but rather with a very natural profile that prevents any tension in the left hand. Important thing to notice : the perfectly adjusted nut which, combined with the headless design, allows a virtually zero useless string lengths, for a killer tuning stability. Mouting the strings is also very easy, the head block is really efficient. My other Hufschmid are mounted with Kent Armstrong pickups which were designed by Patrick himself, crafted directly into Epoxy for a mate and modern stunning look. For this one we imagined something different, as I was more into chrome hardware. So we chose chrome pickups as well, with chrome mounting rings, perfectly matching with the bridge and the head block. They are still handmade by Kent Armstrong himself (who’s very famous worldwide for his Jazz pickups), but with a more traditional look, closer to FilterTron’s. The 12 pole pieces are adjustable in height, for a very fine setup for every string. 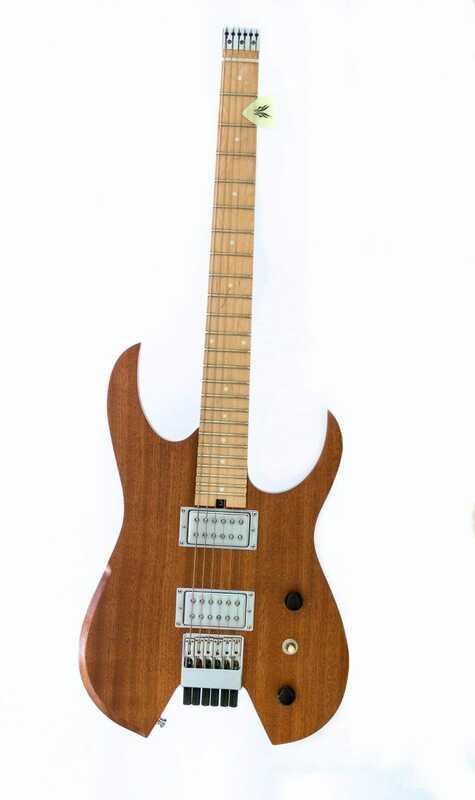 Sonically, this guitar is quite unique in my arsenal of Hufschmids : only headless, only maple fretboard, only one with those pickups. First good surprise : the lack of wood doesn’t affect the resonance at all, I would even say it is improved by the shortened length and the massive bridge ! 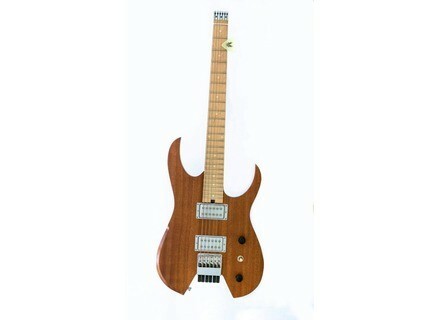 Then the “PAF“ character of the pickups appears as obvious, but with a delightful “twang“ brought by the maple fretboard, making the instrument outstandingly flexible. The cleans are full of warmth without being blurred as they can be with that kind of pickups. The crunch sounds closer to single coils, which is a very good point for me, and the leads are nothing but pure joy, even with extreme gain settings, as those pickups have so much output hidden ! There, the volume and tone knobs show their efficiency and add even more versatility to this axe. I plug it into a Fender Deluxe Tweed, a Hughes & Kettner Tubemeister, or even direct into the PA with a Helix. The guitar has so much attitude whatever the gear : able of almost anything but with its own strong identity, far above pale-sounding generic instruments. All those esthetic and sonic specifications give this instrument a bunch of charm, I can’t leave it since I received it. Above all the rest, the human experience was perfect, as usual, with dozens of pictures during the whole process. Patrick puts a lot into communication, with more than 20 years of guitar building, and this is gold when you consider the amount of luthiers that leave you with no information for months ! I am once more fully satisfied with this collaboration. Working with an artisan keeps being the best option for me, far above a cold purchase from a standard brand, which will never be that personal, no matter how much you put into it. This is a passionate work, by a passionate man, for passionate users.